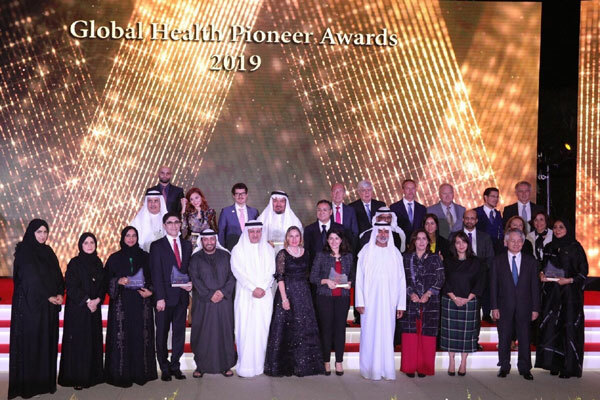 The winners of the first Global Health Pioneer Awards were announced at an illustrious ceremony held yesterday (January 27) at the Etihad Museum in Dubai. The event, held under the patronage of Sheikh Nahyan bin Mubarak Al Nahyan, cabinet member and minister of State for Tolerance of UAE, and president of UAE Genetic Diseases Association, honoured some of healthcare’s most esteemed and noteworthy figures in front of more than 200 distinguished guests. Held in partnership with Italy’s leading private hospital group, Gruppo Ospedaliero San Donato (GSD), UAE Genetics Disease Association and Arab Health, the event was founded by Kamel Ghribi, chairman of GK Investment Holding Group and chairman of GSD Healthcare; and Paolo Rotelli, president of Gruppo Ospedaliero San Donato. GSD is Italy’s leading private hospital group and among the largest in Europe. The group’s model is centred around the patient and combines clinical, academic and research excellence to provide the very best tailor-made and innovative care to everyone. The company opened its first office in Dubai Healthcare City in 2017. “The Global Health Pioneer Award has been established to celebrate the dedication, innovation and commitment of healthcare leaders of the country, while also recognising the vital link between the UAE and Italy while also playing an essential role in supporting the UAE national agenda for healthcare,” said Ghribi. The 2019 edition of the awards was dedicated to the field of genetics, recognising the outstanding efforts of individuals and organisations working towards innovation and advancements in the field of genetics. Those recognised included Dr Tawfik A M Khoja from Saudi Arabia, under the category "Pioneer with Most Outstanding Contribution towards Care and Preventive Health service towards children and families living with Genetic Disorders". UAE’s Ismahane El Ouafi was recognised as a leader in the category "Pioneer Woman Scientist/Physician". Other UAE winners included Dr Sumaya Al-Bloushi, Professor Alawi Alsheikh-Ali, the Wekaya program, Tobacco Control Programme and Haykal Media. Incorporating the key pillars of the Year of Tolerance, including interaction and equal opportunities within the country, several international members of the healthcare community were recognised. George Stephen Hayes from the US, Tiziana Fiorini and Alessandro Frigiola, Giulio Gallera, Luigi Naldini and Professor Silvia Cirri from Italy and Professor George Nara from Japan, amongst others, also won awards that evening.